Perhaps one of the more overlooked, or should I say underlooked, details within Walt Disney World are the road signs the pepper the street corners of Port Orleans: French Quarter. French Quarter is a very quiet resort with well kept squares and a charm that is hypnotic. Since these signs are not within one of the four parks, and the fact that French Quarter is obviously not a resort that everyone stays at, it is only safe to assume these clever signs are indeed a unique feature lost to most. 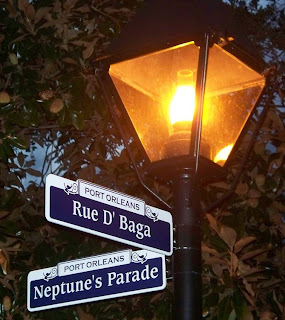 These street signs include names like Rue D’Baga, Rue D’Blues, and, my personal favorite, Cake Walk.